When added into all-in-one (AIO) bags, total needs of exogenous insulin decrease compared to amounts given by perfusor. We studied the influence of carrier solution on insulin availability. A 20 ml polyvinylchloride (PVC) syringe was filled either with saline or AIO solution aspirated from original 3 l bags (Nutrimix, Brown, Melsungen, Germany). Then 8 IU of insulin (Actrapid HM, NovoNordisk, DK) was added into syringes (calculated concentration 400 IU × l -1) and a PVC perfusion line (5 ml volume) was filled. Baseline samples (0.5 ml) for immunoreactive insulin assay (IRI) were taken. Perfusor rate was set at 2 ml×hr-1 and samples taken directly from the hose at 5, 10, 30, 60, 90 and 210 min, placed on ice and stored at 4°C before analysis. Fifteen sets of measurements were done both for saline and AIO solution. Values are presented as means ± SD. MANOVA, ANOVA for repeated measures and paired T-test with Bonferroni correction were used when appropriate; P<0.05 was considered significant. Figure 1 shows IRI concentrations in both saline and AIO solutions during the experiment. IRI differed significantly giving higher IRI yield in AIO solution compared to saline (MANOVA group by time effect P<0.001). Changes in IRI concentration depending on time was seen in saline only (ANOVA time effect P<0.001 for saline; P=0.26 for AIO). 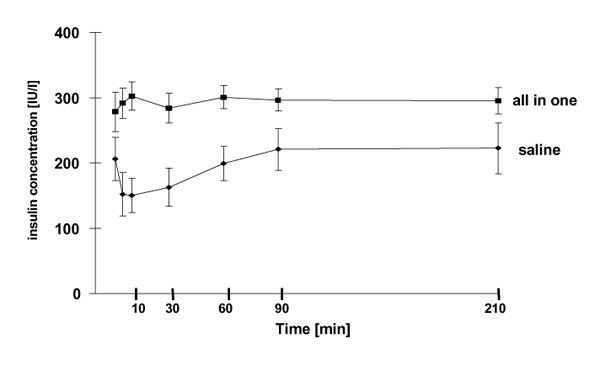 When separate time points for saline were analyzed major changes were seen at the very beginning of the experiment (a decrease from 206± 34 at baseline to 152± 33 IU*l-1 at 5 min; P<0.001). The mean yield of IRI expressed as ratio of measured to calculated concentration at baseline was 0.52 for saline and 0.70 for AIO. Insulin bioavailability in AIO solution is better than in saline with respect to the yield and stability.